This week we feature a live performance from Abhik Mukherjee and Ehren Hanson recorded last week at Brooklyn Raga Massive's residence at Shapeshifter Lab. Abhik Mukherjee is a masterful exponent of the sitar and will be presenting a classical north indian music set, accompanied by Ehren Hanson on Tabla. 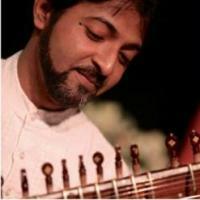 Abhik Mukherjee presents indian music in the Imdadkhani tradition, as heard by such greats as Vilayat Khan, and his virtuosity spans the heavier classical khayal style as well as the lighter, more poetic, thumri style. Ehren Hanson has studied under the renowned Pandit Anindo Chatterjee and has a great command of traditional rhythms as well as providing his own signature playing style to the instrument.